Nearly 250,000 people will be diagnosed with breast cancer this year. That could be your mother, sister, daughter, your wife, or even you. We hold Making Strides Against Breast Cancer walks so anyone touched by breast cancer won't have to face their diagnosis alone. 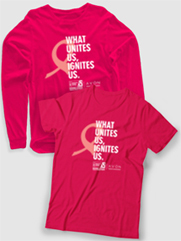 We do it to raise awareness and money to fund research, support services, and early detection. We hold Making Strides events to save lives. Team leaders can really help make Making Strides events successful. The first thing to do is recruit friends, family, and anyone you want to spend a day with to be a part of your team. Then just set fundraising goals, organize fundraising activities, and, on the day of the event, lead your team through a fun walk day. You could also join an existing team or participate as a volunteer at the event. However you choose to become involved, we'd love to see you there! The money you raise at Making Strides Against Breast Cancer events helps save lives from breast cancer. Asking all your friends and family to donate is the first step. But you and your team members can hold fundraisers like a bake sale, car wash, etc. to raise even more money for your team. Facebook fundraisers can also be an important tool to help you reach your fundraising goals. Check out our resources below. Survivors and caregivers are not only an inspiration to us all, they're a beacon of hope for those currently undergoing treatment. Normani Kordei of Fifth Harmony became a caregiver at just 4 years old when her mother, Andrea Hamilton, was diagnosed with stage three breast cancer. They’re sharing their story to help increase awareness about the importance of breast cancer screenings and mammography. More than $62 Million are currently invested in breast cancer research grants.